New Canaan's Alexander Gibbens (5) puts up a shot under pressure from Granby's Dylan Disbella during the first half of the CIAC 2019 State Boys Basketball Tournament Division IV finals at Mohegan Sun Arena in Uncasville, Conn. on Friday, March 16, 2019. New Canaan defeated Granby 55-39. 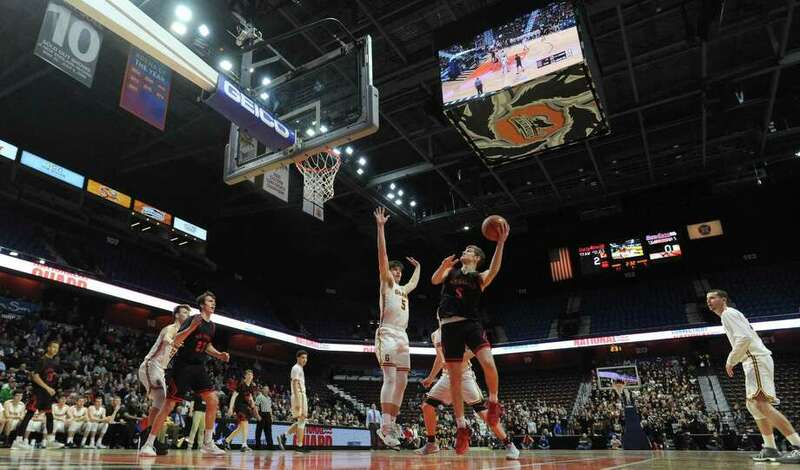 UNCASVILLE — It’s been a memorable year for the New Canaan boys basketball team, right from the start. Between a couple of game-winning 3-point shots that went viral on social media, to qualifying for postseason play for the first time in a decade, to making a run in the Division IV state tournament and reaching its first final in three decades, it all built up to Saturday’s conclusion at the Mohegan Sun Arena. The only way to complete a truly memorable season is by finishing the deal with the hardware. And the fourth-seeded Rams did just that, thanks to their defense and balanced a scoring effort like they have all season long, to defeat No. 3 Granby 55-39 Saturday morning. “Obviously, this means a lot to us. We worked very hard to get here. It’s just amazing to finally get a championship,” said junior Alex Gibbens, who led three players in double figures with 13 points. It’s the first state title for the Rams (20-5) since 1962, when among others, Gary Liberatore and Don Overbeck suited up. The team made just two more final appearances, in 1980 and 1989 in Class LL. “The entire school has been behind us. It’s been extremely exciting and very fun to be a part of,” New Canaan coach Danny Melzer said. New Canaan has done it with defense throughout the season and Granby wilted against the Rams’ full-court pressure in the third. The Bears (22-4) turned the ball over nine times in the quarter, five of which were credited as New Canaan steals. All told, it was a 13-4 run to make it 39-25 New Canaan. The Granby crowd, which had been loud most of the first half, was now quiet and the Rams were on their way to the title. New Canaan outscored Granby 18-8 in the third quarter and 35-14 over the second and third quarters combined. Gibbens, a 6-foot-3 junior, made each of his five field goal attempts, including three from beyond the arc. All told, New Canaan forced 22 turnovers, 10 of which were steals. Granby ran out to a 9-1 lead to start the game. New Canaan didn’t grab its first lead until early in the second quarter on three consecutive three-point shots, two by Ryan McAleer (11 points), the other from Gibbens, to take an 18-15 lead. Granby was able to regain the lead briefly (19-18) before Jack Richardson’s basket with 3:33 left in the first half gave New Canaan the lead for good. Rowan Heinze, a 6-foot-4 junior, led Granby with 13 points. Lost in the 57 years in between state championships for New Canaan was a splendid run to the final by Granby. The Bears won their first North Central Connecticut Conference title since 2006 and reached their first state final in six years. Ben Sarda and Luke Rwambuya, New Canaan: Combined for seven steals, two apiece in the pivotal third quarter, when New Canaan snuffed out any chance Granby had to win. — New Canaan coach Danny Melzer. Matt brand 3 6-6 12, Ben Sarda 3 0-1 8, Ryan McAleer 4 3-4 11, Stephen Wronski 0 1-2 1, Jack Richardson 2 0-0 4, Aaron Fishman 0 0-0 0, Alex Gibbens 5 0-0 13, Luke Rwambuya 1 2-4 4, Leo Magnus 1 0-0 2. Totals 19 12-17 55. Elliyas Delaire 1 5-9 7, Dylan Disabella 1 0-0 2, Rowan Heinze 5 3-4 13, James Shelansky 3 2-2 10, Peyton Large 0 0-2 0, Dan Pierce 2 0-2 4, Parker Hansen 0 0-0 0, Ryan Gemme 1 0-0 3. Totals 13 10-19 39. Fouled out: None. 3-pointers: New Canaan 5-13 (Gibbens 3-3, Sarda 2-7, Brand 0-1, Rwambuya 0-1); Granby 3-9 (Shelansky 2-3, Gemme 1-3, Delaire 0-1, Heinze 0-2). Records: NC 20-5; G 22-4.